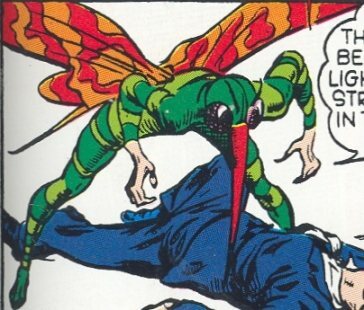 Powers/Abilities: The Butterfly wore a suit that gave him the power of flight, and had a sharp proboscis that could impale his victims. He was armed with a conventional handgun, and had five unnamed goons at his disposal. He never directly communicated with these lackeys, instead using a speaker system wired into a four-armed statue. 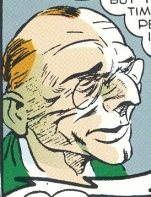 History: (Captain America Comics#3/4 (fb) - BTS) - Dr. Vitoli, curator of the State Museum, took the identity of the Butterfly. The Butterfly became notorious after a number of murders. 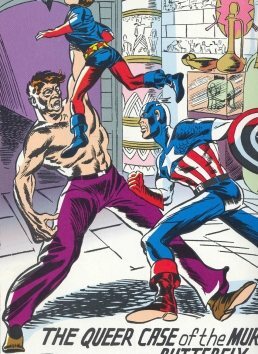 (Captain America Comics#3/4) - The Butterfly warned the press that he would steal the treasures of King Tut, which were going to be displayed at the State Museum. He soon made good on his threat, killing the night watchman and stealing the treasures. Police officers questioned Dr. Vitoli the next morning, and mentioned that the Butterfly overlooked Cleopatra's Diamond, the most valuable piece in the collection. Naturally the Butterfly made off with the diamond that night, killing a new watchman in the process. When Bucky visited the State Museum and started snooping around, the Butterfly's assistant Lenny captured him and stuffed him in a sarcophagus. The Butterfly had his goons rob a city bank to obtain funds for transferring Tut's treasures to South America. Captain America apprehended the goons, and snuck into the museum after closing time looking for Bucky. Cap defeated Lenny and then went head-to-head with the Butterfly. Cap threw his shield at the Butterfly, causing him to fall to the ground and split his head open. Cap unmasked him, and with his final breath the Butterfly told Cap where Bucky was. Reprinted in Fantasy Masterpieces#3 (retitled from "The Queer Case of the Murdering Butterfly and the Ancient Mummies" to "The Weird Case of the Murdering Butterfly and the Ancient Mummies") and Captain America: The Classic Years. He received the name "Plundering Butterfly either in Captain America I#112--in which Captain America flashed back to a number of his World War II era enemies, thus confirming the Butterfly as having been a real character in continuity--or the Official Marvel Index to Captain America, which named the characters. I wonder if Lenny was named after the famous character from John Steinbeck's "Of Mice and Men." I was wondering if the Stinger could've been one of the Butterfly's 5 unidentified goons? The Stinger could have stolen one of the Butterfly's prototype costumes or the blueprint for another one. The sub-profile of Lenny claims he only has peak human strength, but the fact that Captain America had to impale Lenny with a dinosaur skeleton to stop him tells me that he had Super-Human Strength.The reason I believe this is because Cap didn't have to kill other Timely Comics henchmen who were the same size and build like Strangler (Captain America Comics#1 (3/41), Captain America vs. Rathcone story); Monk (Captain America Comics#4 (6/41), Cap story--"Bomb Sight Thieves" --reprinted in Young Allies Comics 70th Anniversary Special#1 (8/09)); Klaus (Captain America Comics#10 (1/42), Cap story--"Spy Ambush"--reprinted in Captain America The Classic Years Vol.2 (9/2000) & Marvel Comics 70th Anniversary Celebration Magazine (2009)); Toto (Captain America Comics#22 (1/43), Captain America --"The Cobra Ring Of Death"--reprinted in Golden Age Of Marvel Vol.1 (10/97) ). Any other characters named "Murder" or "Murdering". Butterfly's assistant in both museum and criminal matters. Peak human strength, but very slow-witted. Caught Bucky snooping around the museum and locked him in a sarcophagus. When Captain America confronted him Lenny pulled out his knife. Cap snapped off a tusk from a dinosaur skeleton and impaled Lenny.